It wasn’t very hard picking a movie in honor of Father’s Day. There are actually quite a few films to choose from that have strong father figures but nothing that compares to Gregory Peck’s iconic performance in To Kill a Mockingbird. I’m sure most of you have seen this classic movie, and I apologize to those of you who visit looking for more obscure finds, but sometimes there’s just no getting around a famous film. This 1962 adaptation of Harper Lee’s Pulitzer Prize winning book, is one of my favorite movies of all time. And it was one of Gregory Peck’s as well. What better role model could there be than Atticus Finch, the widowed Alabama lawyer fighting racism in the deep south in the 1930s, while trying to be a responsible and caring parent to his two young children. A wonderful family movie, To Kill a Mockingbird, is a timeless classic that exemplifies the best of American film making with themes still relevant today. Not only does it model justice and morality but compassion, integrity and the value of family – all accomplished under the subtle direction of Robert Mulligan. Some of the courtroom drama might be a bit disturbing for young viewers but most of the film is beautiful and evocative of a time gone by. The movie also marks the remarkable film debut of Robert Duvall in the role of Boo Radley, the slow yet heroic next door neighbor. His amazing performance put him on the Hollywood map. If by some chance you have never seen this classic film, put it at the top of your Netflix queue. It is a movie that will resonate with you long after you are finished viewing. And if you were ever wondering where the title came from, take a moment to watch this clip. This entry posted in entertainment, film. Entry Tags: Classic Films, Gregory Peck, Robert Duvall, To Kill a Mockingbird Bookmark the permalink. Well, this is the movie that constantly remains at the top of so many lists year after year and the reason for that is so obvious once you have seen it. Great choice…must view again. The book and movie inspired me to go to law school! Being from Alabama, I grew up reading and watching To Kill A Mockingbird. Such a brilliant story and movie. I think I will watch it again! as only Gregory Peck could deliver this line, I don’t think this film should ever be re-done!! Great choice Q, you rock!! Went through this classic with my son this year. Fabulous lessons to be taught there and a fabulous movie to accompany it. Good pick!! You definitely picked my all time favorite! So perfect for father’s day, I may have to rent it this weekend! Have a wonderful celebration! A favorite as a film and as a book! Heading up to the in-laws this weekend and I know they have this one on DVD – thanks for the Friday find. Wishing you a wonderful weekend and a Happy Father’s Day to your loved ones. what a perfect father! A favorite of mine… both film and book. I must admit to having a crush on another father… Captain Von Trapp — dreamy… he could sing Eidelweiss to me every night and I would sleep like a baby! 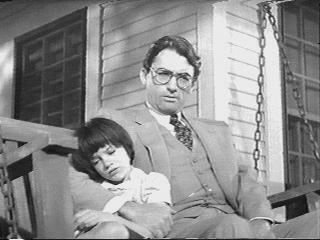 Atticus Finch is such a great role model for everyone, even those who are not quite children anymore! 80 queries in 0.453 seconds.